Previous Interplay-published version supported OS X as well. Comes configured with the Fallout 1 High Resolution Patch. Comes configured with the Fallout 1 High Resolution Patch. The Linux version of Fallout 1 is actually the DOS version which uses DOSBox in order to play it. It was exclusive to Desura store and it is no longer available. The same is also true for the digital release of the Mac version, though the retail version was a true native port. 1024x768 resolution using the Fallout 1 High Resolution Patch v3.0.6. A utility/patch that modifies the game in memory to add support for windowed mode, higher resolutions, and various other enhancements. Further details can be found in the official thread. Patch compilation which contains several essential patches and bug fixes, allows for high and widescreen resolutions. Also contains optional fan content. updating to the latest version of Crafty's Sfall is recommended to fix bugs, version included is out of date. Save games can be transferred between Windows, Mac OS and DOS installations of the game. 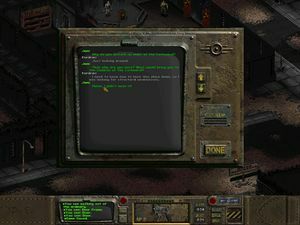 Native widescreen support in the Bethesda releases on GOG.com and Steam via the Fallout 1 High Resolution Patch. For any other version, use the Fallout Fixt patch. Fallout Fixt patch allows 4K, but it is not recommended. Text becomes too small to read, and there is no improvement to graphical quality relative to lower resolutions. 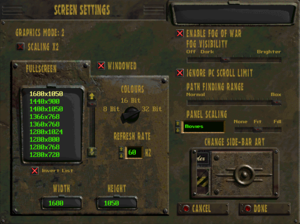 Use D3DWindower or the Fallout 1 High Resolution Patch. 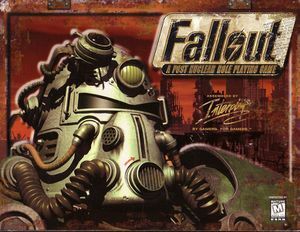 Use Fallout Fixt or Fallout 1 High Resolution Patch and in f1_res.ini set "WINDOWED=1" and "WINDOWED_FULLSCREEN=1"
Game is coded to run at low FPS, but mouse control is unaffected. Official localization by «1C-Softclub». Local retail version only. Unofficial translation by «Fargus Multimedia». Use the fix below; if it fails see Rainbow color problems in older games for solutions. If this fix fails see Rainbow color problems in older games for solutions. The CD version of the game reports an error upon start-up if run on modern versions of Windows. Run the installer in compatibility mode for Windows 95. 9 Requires the Fallout 1 High Resolution Patch. 3.0a, 7 DirectDraw 7 support requires the Fallout 1 High Resolution Patch. Mac OS, OS X, and Linux only. ↑ 2.0 2.1 File/folder structure within this directory reflects the path(s) listed for Windows and/or Steam game data (use Wine regedit to access Windows registry paths). Games with Steam Cloud support may store data in ~/.steam/steam/userdata/<user-id>/38400/ in addition to or instead of this directory. The app ID (38400) may differ in some cases. Treat backslashes as forward slashes. See the glossary page for details. This page was last edited on 28 March 2019, at 18:14.